The church: Trinity Episcopal, Tulsa, Oklahoma, USA. Denomination: The Episcopal Church, Diocese of Oklahoma. The building: A imposing Gothic limestone cruciform structure covering almost an entire city block. 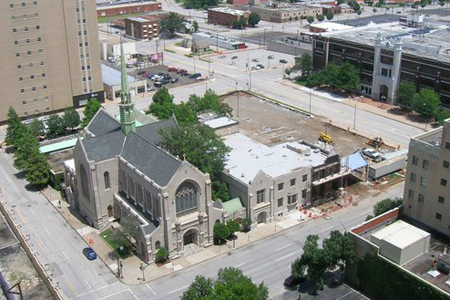 The original church was demolished in 1920 so that construction could begin on the present edifice, the congregation, meanwhile, meeting in a downtown theater. Although small compared with European Gothic churches, the building is perfectly proportioned and so looks larger than it actually is. Notable is a series of stained glass windows depicting the Apostles Creed, with Adolph Hitler's face appearing in the window entitled "He descended into hell." The interior also features some very fine wood carvings. The church: Their numerous activities and outreaches are described on their website. The great hall is available to be rented for weddings, banquets and other such events. There are three masses each Sunday using both Rite I and Rite II. Choral evensong is held twice each month, as well as a Taizé service the second Sunday of each month. The neighborhood: Tulsa, in northeastern Oklahoma, derives its name from a Creek Indian word meaning "old town." Once heavily dependent on the oil industry, the city's economic base now includes aerospace, finance, technology, telecommunications and manufacturing. Tulsa is located near the geographic swatch known as Tornado Alley, and often experiences violent thunderstorms with large hail and damaging winds, as well as tornados. Trinity Church is located in a mostly non-residential area of downtown, and as such is definitely a commuter's church. The cast: The Revd Joseph Alsay was the officiant. Special guests were the Tulsa Boy Singers, Casey Cantwell, Artistic Director. The date & time: April 20, 2008, 5.00pm. Almost completely full. Latecomers had to work hard at finding seats for themselves. A team of very friendly and welcoming ushers handed out the order of service, as well as programs for the concert that was to take place later that evening. Fairly typical wooden pew. No cushions. Great for the acoustics, not so great for the derriere. One of the choirs performing at the concert later that evening was rehearsing. The choir sang "The Lord is in his holy temple" as they processed in from the narthex. The officiant then said, "Grace be unto you, and peace, from the Lord Jesus Christ." We used only an order of service produced in-house. It was very good, actually – every word that was sung or spoken was included. The church's massive Moller pipe organ. The congregation was full of visitors and so the atmosphere was very "touristy." There was lots of chatter and people making comments. Not really a reverent atmosphere, though that's not the church's fault. Very traditional high church evensong with plenty of incense. Some have called solemn evensong the Crown Jewel of Anglican worship. The altar party was clearly well versed in the rubrics, and gave their full energy and attention to the service. The music was done very well. The constant chatter from people around who were confused (despite the excellent service booklet) and coughing from the incense. The ushers very efficiently moved people along in the direction of the great hall, where a reception had been planned. A delightful buffet of wine, soft beverages, and nibbly bits. Unfortunately they had underestimated the crowd, and so things ran out fairly quickly. 7  If I were free to attend on a more regular basis, this would be a church I'd strongly consider. Delightful. Incredible connection with our Anglican heritage.